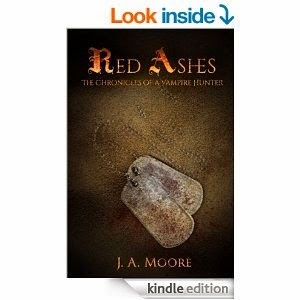 Red Ashes (The Chronicles of a Vampire Book 1) by Justin Moore. Being a vampire hunter is hungry work. John Magnus was your not-quite-so-average orphan-turned-Marine before his convoy was attacked by vampires, leaving him as the only human survivor. John's journey as a vampire hunter takes him to San Diego, where a vicious new foe--and a new family--await him. John's Uncle, a prodigious vampire hunter, trains John in the finer points of slaying the denizens of the night until an unexpected ambush turns everything upside down, and John is forced to fight against a new threat that he was just beginning to understand. This is an urban fantasy novel with the main focus on vampires. John Magnus, is a US marine who finds his team decimated by unnatural beings - after barely surviving the incident, he discovers that vampires are real. He also learns that he has special powers and that he has a long lost uncle who knows everything about vampires and other supernatural beings that go bump in the night. This was a fast paced, action fuelled story that flies through the pages. It didn't take me long to finish the book. I felt the main character, John, was likeable and believable, but there wasn't much flesh to him. The pace of the book also makes it difficult to grasp the other characters. However, this is the first book in the series so I'm sure the author has plans to introduce more scope to his characters. The storyline was interesting to read and I enjoyed learning what made John and his uncle unique. If you're looking for a quick, satisfying urban fantasy story then Red Ashes is definitely worth a read.